A natural choice for behavioural support to help cats and dogs cope with stressful situations. Zylkene contains a natural product, derived from casein, a protein in milk. It is a molecule well known to promote the relaxation of new-borns after breastfeeding. Launched in April 2008, Zylkene has become a valuable support for veterinary surgeons, behaviourists, nurses and pet owners for use in helping pets cope when facing challenging situations. Please remember that there are many ways our pets can respond to new and unpredictable situations and not all animals respond in the same way, keep an eye on your pet to see any unpredicted behaviour changes. 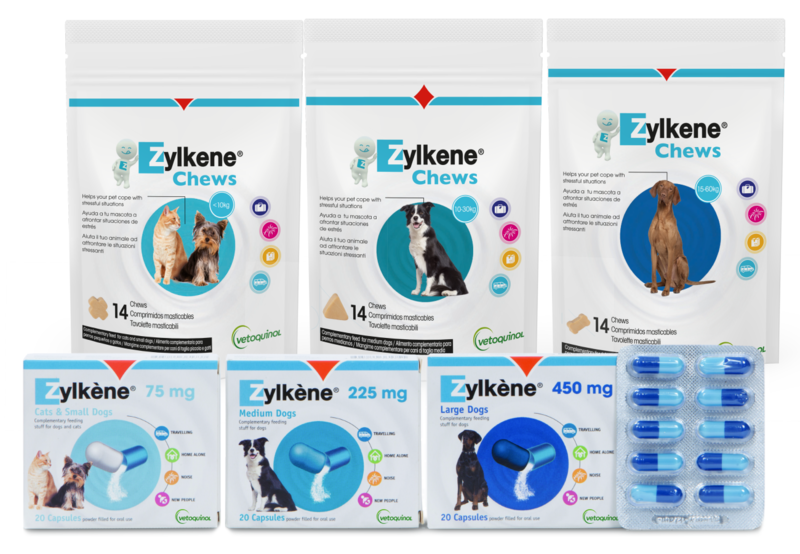 Zylkene and Zylkene Chews are complementary feeds for cats and dogs. Zylkene Chews can be given as a tasty treat. Short-term use: Use Zylkene® for 1–2 days before a planned event or change in environment. Some animals may need earlier administration (5–7 days). Long-term use: Give Zylkene to the dog or cat for one month then reassess their behaviour, continue if needed. Or use as recommended by your veterinarian.